Nanotechnology is the next wave of innovation and technology to be brought to the marketplace. With it comes many diverse benefits and potential health and environmental risks that need to be determined and assessed in light of modern life advantages and potential toxic risks. The National Nanotechnology Initiative (NNI) defines nanomaterials as any material that has one dimension less than 100 nanometers (nm) (see http://www.nano.gov/ for more details). That is 10,000,000 times smaller than a meter (one long walking stride). Their diminutive size makes them virtually invisible to the human eye. Some are so small that even the most sensitive electron microscope cannot detect them. Nanomaterials are so useful because of their large surface area compared to their mass. This means that nanomaterials have many atoms on the surface that can react with the environment, as compared to larger materials where most of the atoms are locked away in the center. Nanotech products are already in the marketplace and have a stunning array of uses. Some common nanomaterials are quantum dots (Change their size and they are a different color! 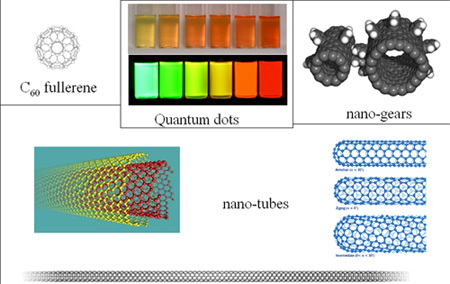 ); fullerenes, or buckyballs, which look like miniature soccer balls; single-walled or multi-walled carbon nanotubes (SWNT or MWNT); and nano-thickness films (Figure 1). In medical applications, nanotechnology is being developed for enhanced drug delivery to specific target sites. For example, animal studies show promising results for delivering drugs specifically to tumor cells and eliminating cancers without the negative side effects of traditional chemotherapy, radiation therapy, or surgery. Similarly, HIV, atherosclerosis, and bio-imaging therapeutics are being developed. Nanotech dental bonding agents are already in use. Figure 1. Examples of common nanomaterials. Energy and electronic industries have also embraced the new technology. Nanomaterials (excellent catalysts due to their high surface area to mass ratio) are becoming integral components of new, highly efficient fuel cells and solar cells that may ultimately increase use of renewable energy sources and decrease dependence on fossil fuels. Using nanotechnology to make transistors and memory storage-devices much smaller means high-speed laptops and handheld devices are now on the market. The bright display screens on the new generation laptops and the small, handy memory sticks are all results of nanotechnology innovations. The materials have other uses as well. Nanotechnology is found in consumer products such as color-changing T-shirts, high-tech athletic gear (Nano-Tex), longer lasting tennis balls, and improved car bumpers and tires. Larger nano-sized liposomes in personal care products enhance sunscreens and cosmetics delivering vitamins and other skin-care products deep into the skin. In the environment, nanotech bioremediation and nano-filtration remove organic toxicants, and even hormones, from water and soil. Although beneficial, many researchers studying the toxic effects of nano-sized materials remain cautious. Limited studies reveal potential health and environmental problems. For instance, some research found that inhaling nano-sized particles causes more severe reactions than breathing the same chemical in a larger size. After inhaling them, they can move into lymph nodes, the blood, the heart, the liver, and even the brain. However, the few studies looking at effects of ingestion show that 98 percent of nanomaterials are eliminated rapidly via the feces and urine. Initial studies indicate that smaller nanomaterials are not absorbed through healthy skin, although very little research is currently available. Nano-sized materials can also react with oxygen to produce reactive oxygen species, those naturally occurring, free-roaming molecules that cause DNA, cell, and tissue damage. Normally, cell respiration produces small amounts of reactive oxygen species every day, which is why we take daily antioxidant multivitamins. But nanomaterials can greatly enhance the amount of reactive oxygen species available to cause damage. Single-walled nanotubes (SWNT), currently used as conductors and semi-conductors, can wrap around any protein or even DNA in their vicinity. Cell culture experiments show that SWNT wrap up proteins and could potentially interfere with cell signaling. Much furor has surrounded the findings since they were first presented at a scientific meeting. Those who believe that sci-fi nano-robots will turn the world into gray goo have used this research to call for a ban on nanotech research. Proponents of nanotech have begun a smear campaign against this research, picking on perceived and actual limitations. But this is just one study that needs to be repeated due to limitations, including the fact that the exact chemical characterization was incomplete. This is how science works. Research is conducted, shortcomings are identified, the studies are repeated, and ultimately, we determine whether nanotechnology is worth the risk. At this point we do not have enough data to accurately characterize the risk of nanotechnology. We do have enough data to realize that nanotechnology is revolutionizing modern-day life. Imagine eliminating the need for fossil fuels (and the oil spills, urban air pollution, etc., that accompany its use) because nanotechnology is used to perfect fuel cells and make efficient solar panels. On the other hand, we need to ensure that health and environmental disasters such as those experienced with PCBs and DDT are not repeated. Because of the tremendous potential benefits, it is important to continue to improve nanotechnology products while at the same time determining any toxic effects. 1. Oberdörster, E. 2004. Manufactured Nanomaterials (Fullerenes, C60) Induce Oxidative Stress in the Brain of Juvenile Largemouth Bass. Environmental Health Perspectives 112:1058-1062.